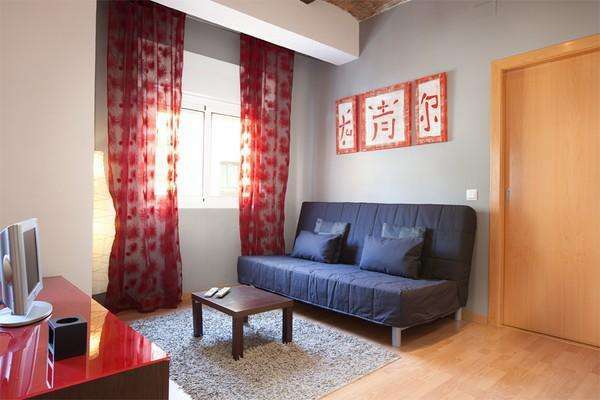 Situated in the beachside area of Barceloneta, this one-bedroom apartment in Barcelona, is the ideal choice for your trip to the Catalan capital. Located in close proximity to the beach, as well as the city center, tenants will enjoy easy access to all that this great metropolis has to offer. Able to accommodate up to four people, this apartment is perfect for families or couples on their Mediterranean adventure! The apartment welcomes guests upon arrival with a mix of modern and classic elements. The traditional touch is best displayed by the original exposed ceiling beams, while the parquet flooring throughout adds to the clean and light feel of this lovely locale. The living room is furnished with a comfortable double sofa bed, and a TV, perfect for relaxing after a long day. The modern fully equipped kitchen allows tenants to create their very own home-cooked meals, or even try your hand at some Mediterranean inspired dishes! The bedroom is furnished with a double bed. The apartment has one bathroom, fitted with a walk-in shower. This charming apartment, complete with central heating, heaters and air-conditioning, is a great choice for your stay in Barcelona, any time of the year!